It seems kind of unnatural to think about selling your new home right when you are buying it. But, resale value and ease of resale should be at the top of your list. It is a big deal for members of the military who may be in the house a shorter time than a regular buyer. Because members of the military are only in a location for three to five years on average, it is very important to buy a house that will resell as easy as possible in a few years. You may not want to have the best home in your neighborhood or even on a particular street. 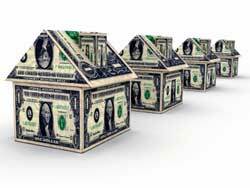 You could possibly price yourself out of the resale market if you are not careful. You will have to find the perfect buyer who is looking for an upscale home in a neighborhood full of middle of the road models. My next door neighbors recently put in an automatic sprinkler system and professional landscaping to the tune of $12,000. While their house is the nicest one on the block, they will have a very hard time recouping that much from their inflated asking price when they sell. Now that I am a new homeowner, I see all kinds of potential in my new house. I want t update the countertops, add a back splash, redo the landscaping, put in a new custom shower in the master bathroom, etc. But, will these upgrades payoff in the short time that I will be in the house? Probably not. The one consolation will be the pleasure that I will get by living in a nice house for the one or two years that I have left there. Proximity to amenities means a lot to most people when they are buying a new house. There is a plethora of new and existing homes sitting empty these days as everyone knows. So, it is still a buyer’s market. How close is your home to access roads, the entrance to the neighborhood, good schools, the base’s gate, Wal-Mart, etc.? These may not matter to you, but they matter to a lot of people. And, with more and more choices available to buyers, there is no reason for them to compromise on home attributes that they value. All of these things will weigh heavily on your future home buyers. New versus older homes is an interesting conundrum. My wife and I bought a new home in a brand new subdivision. We are about the fortieth house to be sold in a neighborhood with eighty plots. The problem comes into play if we try and sell our home before the builder is finished building all the homes in our neighborhood. Why would a potential buyer purchase a three or four year old house when they can have the exact same model with the brand new house smell for the same price or less? If the rest of the lots are not already built by the time I sell, I will have a hard time selling my home for full price. Like buying a brand new car, I have driven my home off the lot and taken the depreciation hit. Military home buyers face unique circumstances and obstacles when they buy and sell homes. Only if you consider the end state or your objective from the day you purchase your house will you be a successful military home owner.